We’ve Seen It All and Will Help You Craft a Menu That Works. Cleveland Menu wants your business to be a success, and one way to help ensure that, is to have a menu that works. Menucraft is all we do and we’ve perfected it. Here is what makes a menu work. When a dollar sign is used on a menu, diners are more likely to choose a cheaper option. * For example, if your ten entrees are priced with dollar signs from $64 down to $12, diners are more likely to choose the less expensive options. Instead of pricing an item at $14.00, it will create less psychological interference if you price it at 14.00. Even better is listing the item at 14. A Cornell University study found that spelling out the price, “Fourteen,” also encourages patrons to spend more. Do not put prices in a column. Your guests will read down the price column and then look to see which items match what they want to spend. Listing the price after the meal description in the same size font allows the guest to choose what they want to eat, not what they want to spend. Diced Black Forest ham, chopped green bell pepper, diced onions with melted American cheese. There is a psychological theory called “the paradox of choice.” It means that the more options we have, the more anxiety we feel. Providing too many choices will overwhelm and confuse diners, who will typically choose an item they have had before, just to decrease their anxiety. Make it easy for them to make a choice. Don’t include desserts on your main menu because if diners see a dessert that they want at the beginning of their meal, they’ll skip an appetizer or order a smaller plate. Presenting your diners with a dessert menu after their meal increases the chances that they will order one and will increase both your appetizer and dessert sales and profits. 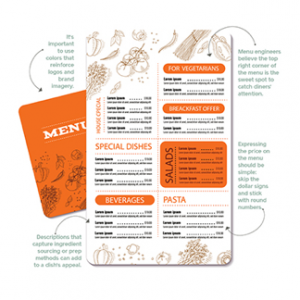 Menu placement is extremely important and human behavior when reading a menu is predictable. Diners don’t read menus from top to bottom, left to right. The first place a person’s eye goes to on a two-page menu is just above the center on the right hand page. Next, people’s attention goes to the top of the left page. Followed by bottom of the left page, top of the right page and finally, bottom of the right page. 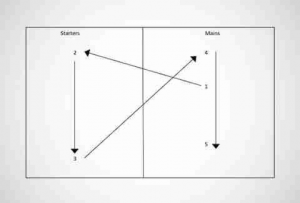 Placing the right items in the right areas will ensure your menu works for you. A different strategy is to place your most popular menu item last on the right page to encourage people to read the entire menu to find it. The psychological concept known as the “serial position effect” is the tendency to remember the first and last items in a list more than the others, so another option is to place popular items first or last so that they are remembered. Of course, you understand your menu items and customers best, so do what works best for you. Placing a signature item apart from the rest of the menu, with empty space around it, will draw your diners’ attention to it. But use them sparingly! Placing a photograph with every single menu item tends to be a technique associated with low-end or cheap restaurants. We suggest avoiding cliché stock photos, or overly staged pictures, and use a style like you would see people posting on Facebook or Instagram. Authentic looking food photos are more effective. Perspective is important, especially on menus. One strategy is to include a very expensive item near the top of the menu, which makes everything else seem reasonably priced. A $12 cocktail is a real bargain compared to that $75 glass of Scotch! Colors can be powerful motivators, if used correctly. Color is a powerful communication tool that helps create feelings and emotions and can be used to signal action, influence mood, and even influence physiological reactions. Psychologists, researchers and experts have made several significant discoveries about how color impacts our moods, feelings, and behaviors. For example, blue is a soothing and calming color and research suggests blue is an appetite suppressant, so printing a menu with blue ink on blue paper may discourage diners from ordering an appetizer or dessert. Red, on the other hand, can stimulate appetite, so you may want to strategically use red in your menu design for items with the highest profit margins to increase sales. According to a Cornwell University study*, longer, more detailed item descriptions sell 30 percent more food. The more copy you provide about the menu item makes it seem that the customer is getting more for their money. If there is one item on the menu with a longer description than the other items, diners will notice because we are conditioned to notice something that’s different. Use this difference to call attention to a best-seller or high profit item. Use vividly descriptive titles, which boost sales. Instead of offering “Chocolate Mousse,” try “Decadent Old-School Chocolate Mousse.” An added benefit is that diners typically believe more thoroughly described food tastes better! Use the phrase “House Favorites” or “Chef’s Favorites” instead of “specials,” which sounds cheap and greasy spoon-ish. Don’t capitalize everything on your menu. It’s acceptable to capitalize the menu items, but use lower-case for the description to slow down the reader’s eyes and keep them from glossing over the whole menu. You want your menu to do as much of the work as possible and using the right words will help do that. Too many words on a menu can be overwhelming and lead to paralysis. Our best advice is that your menu descriptions should be long enough to describe the food, ingredients and how it is prepared to create enthusiasm for the dish. Whether it is true or not, we tend to romanticize the past and consider it “the good old days.” You should consider using this sense of nostalgia to take diners back to their childhood or to a simpler time. Nostalgia takes us to a place where we ache to go again. Use it to your advantage. Your menu must reflect your brand’s personality, story, and promise. The human brain is wired to respond to storytelling and your brand personality is telling its story. Why do customers need it or want it? Why do they buy it? Is it your commitment to sourcing local ingredients? Providing comfort food? An upscale dining experience? Authentic barbeque? Whatever it is, that is your brand story and personality. Your brand’s personality, story and promise must drive your menu creation. In fact, it has to drive your entire business, from your signage to the color you paint your walls to the way your servers interact with diners. Your brand story is the most important asset you have. Cleveland Menu will work with you to craft the perfect menu that reflects and builds your brand story. In fact, make an entirely separate menu for your secret menu. You know, the menu that supposedly doesn’t exist. Put a few items on it – really special items. Share your not-so-secret menu with selected guests and word will get out! Your secret menu will become, well, not-so-secret. Have fun with it! Deny it exists, even as you hand a diner a menu that says “Chef’s Secret Menu” on it.